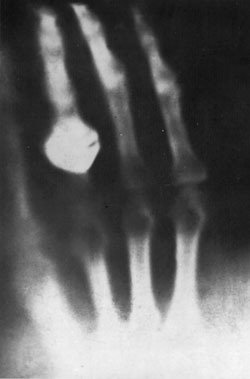 in the path of the rays over a photographic plate, he observed after development of the plate an image of his wife's hand which showed the shadows thrown by the bones of her hand and that of a ring she was wearing, surrounded by the penumbra of the flesh, which was more permeable to the rays and therefore threw a fainter shadow. "When she saw her skeleton she exclaimed 'I have seen my death!'" The discovery revolutionized the practice of medicine; for it, Röntgen won the 1901 Nobel Prize in physics.